Some people think of poppycock as "crunchy" caramel coated popcorn. 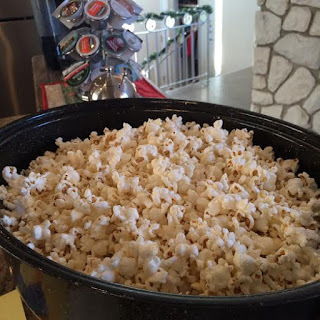 To me, poppycock is definitely a caramel popcorn, but the texture is much more of a chewy caramel coating. This chewy, gooey and super sweet caramel coated version has been a staple of almost any get-together that I have hosted. It is definitely one of the most requested treats from my sugary rotation. I've boxed it up and included it with wedding gifts, made triple batches for summer BBQ's, dropped off as a get well gift to friends, and it is a feature on pretty much any holiday treat tray that I create. So the secret is out now.... This is one of the easiest recipes ever. I don't even use a candy thermometer. (Even though I feel like a real adult now and actually purchased one late last year). When measuring out your popcorn, make sure to minimize the un-popped seeds that make it into your bowl. When you're devouring the finished product, you may utter some choice words if you crack a tooth on one. Measure your popcorn out into a bowl that is much larger than you think you'll really need. 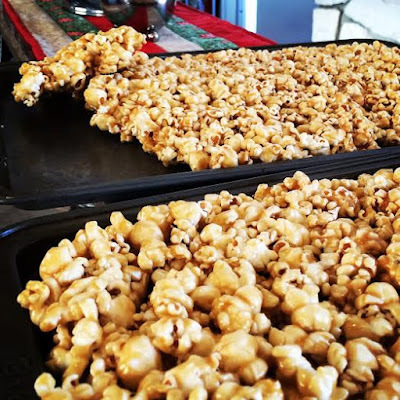 When you pour the caramel on, you'll want to stir pretty quickly and you don't want to be flinging half coated, sticky popcorn over the edges if it's too full. I use the biggest roasting pan that I own. Have your cookie sheets ready, greased with margarine (or lined with parchment), prior to starting this project. Everything sets up quickly, so it's a pain to be running around like a lunatic, stepping on Hotwheels while frantically trying to get them ready. Pop enough popcorn to measure approximately 24 cups. I use my 4 cup glass measuring cup, and heap it with each measure, so anywhere between 24 and 30 cups is reasonable given how fluffy the popcorn is. My turkey roaster FULL of popcorn ready to soak up the gooey topping! Melt butter in a large, heavy duty saucepan. Add brown sugar and corn syrup and stir constantly over medium high heat until mixture reaches a rolling boil. Continue stirring for 1 minute past the rolling boil stage. 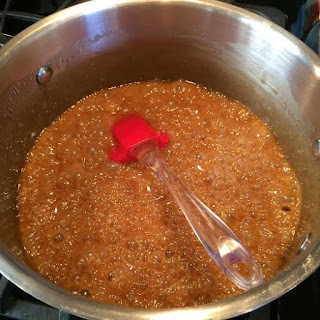 (Here lies the beauty of this recipe... boil for longer if you want a less "gooey" caramel. Stir for about 2 to 3 minutes longer if you want the caramel to really crystalize and firm up for a crunchy end result). Butter, sugar and corn syrup at the rolling boil stage. I go for exactly one minute. Remove from heat, and quickly stir in the vanilla. Pour mixture over prepared popcorn, and stir quickly with a large spoon to evenly coat the popcorn. Dump onto slightly greased (or parchment lined) baking sheets and use a rubber spatula to spread it out evenly and lightly press it together. You can use your hands too, but be warned the mixture will be quite warm! Let cool and break into pieces. This freezes exceptionally well in an airtight container or ziploc bag! O my dear...there is no going back now. Poppycock for everyone.